Looking like Harvey Keitel – and killing like him. 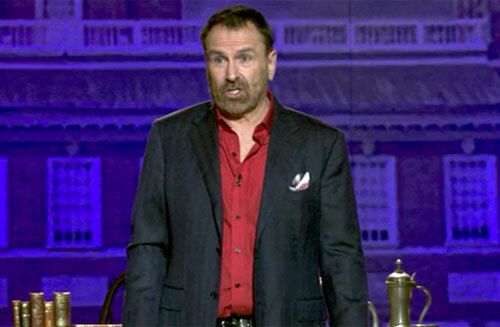 Standup comedian Colin Quinn flexes his brain bone – and incites Americans to flex theirs – in this refreshingly intelligent take on the U.S. constitution. Now all we need is for Congress to grow a brain and listen to him. UNCONSTITUTIONAL finds the Noo Yawk raconteur in his finest form. Ever. Always been a fan of Colin Quinn’s scattershot comedy; have followed his career as generally as anyone with a cable and internet connections, but this feature has cannoned him above the morass of his contemporaries who pule about girlfriends and pets and being stuck on planes with screaming kids. Please observe the Fasten Seat Belts sign; Colin Quinn is entering George Carlin airspace. Quinn’s rapid-fire extolling of the constitution’s underlying concept – to get rid of the class system that America left behind in England – echoes the current call to arms that an Englishman (Russell Brand) is now making to world societies (in his insightful book Revolution). It goes to show that those Founding Fathers (Washington, Jefferson, Madison, Franklin, Adams and the rest of the Ringos) actually got the concept right, but the reality of power and the avarice and privilege of leadership just kinda got in the way. Whenever a comedian’s “observational humor” tilts into actual “sociological issues,” in my book, they’ve won. If they do it artfully enough, they extricate themselves from the engine pit and deep-gouge their name in history books.